Grays, rustics, Shaker-style cabinets. If we had to sum up the last several years in kitchen trends in just a few words, that’s where we’d probably land. Ooo, la, la, we like this trend. What we might’ve once deemed “European,” is now simply high style on parade. Clean, sleek lines. Modern, minimalist hardware. Often-dark overtones (some got downright moody). We wouldn’t want to show up for dinner in our sweats in these elegant kitchens! The nice thing about this trend, especially for those of us in the surfaces business, is that it mixes equal parts solids and wood grains. White, gray or even black solids, often with luxurious finishes like smooth matte or high gloss, combine with gorgeous woods. 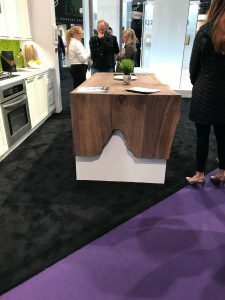 And while “real” wood will always have a place in luxury homes, engineered surfaces have reached such a level of sophistication — with high fidelity designs and deep, realistic textures — they’re finding their way into high end interiors where sleek and European make them not just cost-effective but design-imperative. 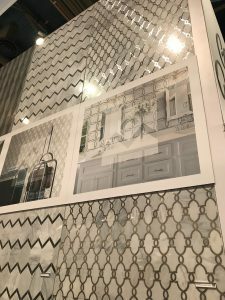 Continuing the sophistication theme, we saw a lot of luxury metals — silver and gold — integrated into tile patterns, especially. Dramatic metals and stone patterns, too, were taking center stage as focal points (think fireplace surrounds and large architectural panels). Sometimes the real thing, often an engineered alternative, these accents were everywhere. And stone wasn’t just marble or granite this time, but included a mix of other creative patterns and structures. (Asks nearby colleague: does this go here?) 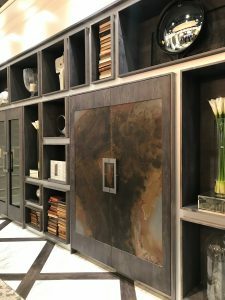 We also love, love, love the dramatic introduction of burnt wood accents and features, called shou sugi ban, a Japanese finishing technique. This look, too, was found on “real” materials and is also being captured on engineered surfaces like TFL (thermally fused laminates). Dark, texture-rich and attention getting, it makes for a real conversation piece. Silver and gold heighten the elegance factor. White still dominates, but is being complemented — whether in Shaker, sleek or traditional interiors — with pops of, well, lots of things. Pops of wood. The last couple of years, we’ve seen combos of wood grain lower cabinets and white on top. 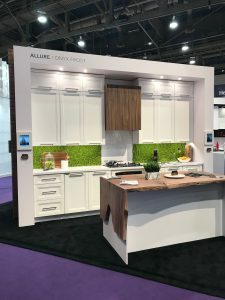 This trend continues but wood is also making more distinctive appearances in white kitchens and baths with one dramatic accent, like a raw wood inset on a countertop or backsplash, or a single exotic wood wall. Pops of drama. 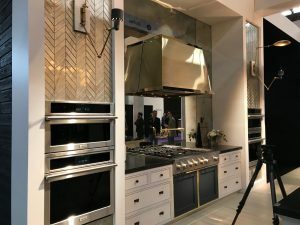 We captured this above, but worth noting here too, as kitchens are clearly taking center stage in new ways. Sleek white cabinets with pops of wood. The raw, natural island inset provides a stunning contrast. Wood grain surfaces are lightening up. We’re not talking about simply a head back toward the light maples and birches of yore. Even still-popular walnut grains are showing up in their near-natural state. It’s a simple move but one that makes a world of difference, as the wood grain and color, themselves, become the focus, rather than simply the color of the stain. We’re seeing this as the natural evolution of the rustics trend. Still natural — even raw — but also elegant and sophisticated. We can tell you from an engineered surfaces perspective that white was, is and will likely remain king of the kitchen, bath and closet. And grays are still maintaining their reign as queen. What we’re seeing now in all of these trends is a way to work other features — grains, textures, metals and more — in and among them. There are definitely some new things to talk about this year. Natural materials (or likenesses thereof) provide dramatic relief to equally dramatic solids.